I often get asked which is better — Gmail or Hotmail (or its derivative outlook). The answer for me is so easy: Gmail, and one of the reasons is because it handles phishing attempts so much better than Hotmail. I only log into my Hotmail account once a month or so, just to keep it alive. This time, there were approximately 20 emails in my inbox. A few were legitimate security alerts created by my Google account, a few were from Microsoft trying to sell me something or other, but the rest (over half) were phishing attempts — bogus emails attempting to get me to click a link where they would prompt me to reveal private details such as account numbers or passwords. Fortunately, there are often telltale signs that the emails are not legitimate. The following email, for example, has a few obvious indicators. (1) Why would RBC be sending email from a bell.ca account, and (2) why is the URL pointing to a website in Poland? This email below is just as obvious. The return address is from Holland (1), which is probably not where Walmart’s head office is(! ), and the URL is to a link that includes mostly Cyrillic characters (2), which I doubt Walmart would be using. I’m really shocked, honestly, that Hotmail didn’t filter these emails out before they reached my inbox. Gmail, however, does an excellent job of doing so, as I can’t think of a single phishing email reaching my inbox in a year or two. What to do if you get an email like this? 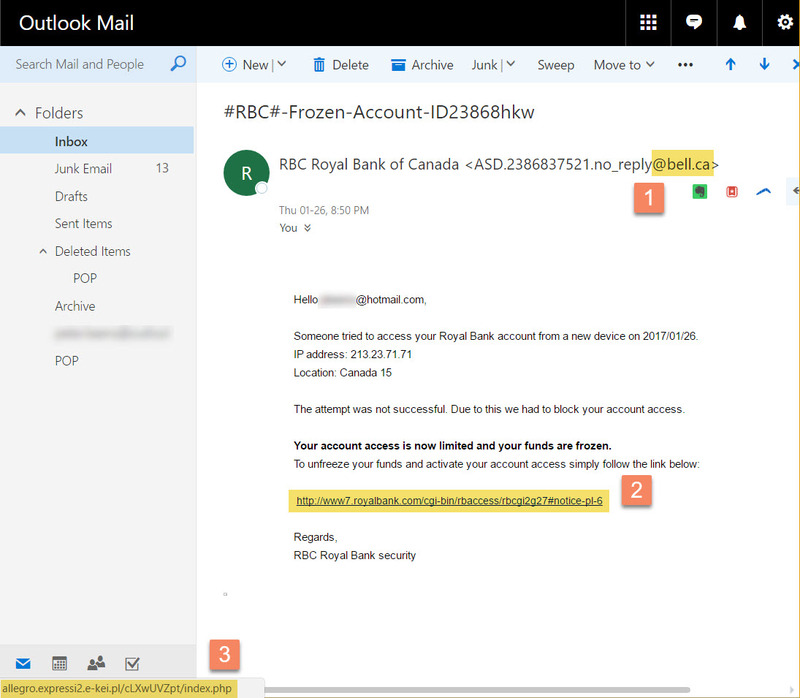 The obvious thing is just to delete it, but if you’re not sure, as in the case of an email that looks like it’s from your bank, is to call your bank to confirm your account is still in safe hands. Does anyone have a different experience than mine? Would you give any other advice? The only downside I have to Gmail (and I haven’t used Hotmail in YEARS) is that it does put a lot of legitimate emails in my Spam folder. And I have had a couple of phishing attempts sneak through. But you’re right, generally Gmail is so much better than Hotmail generally. 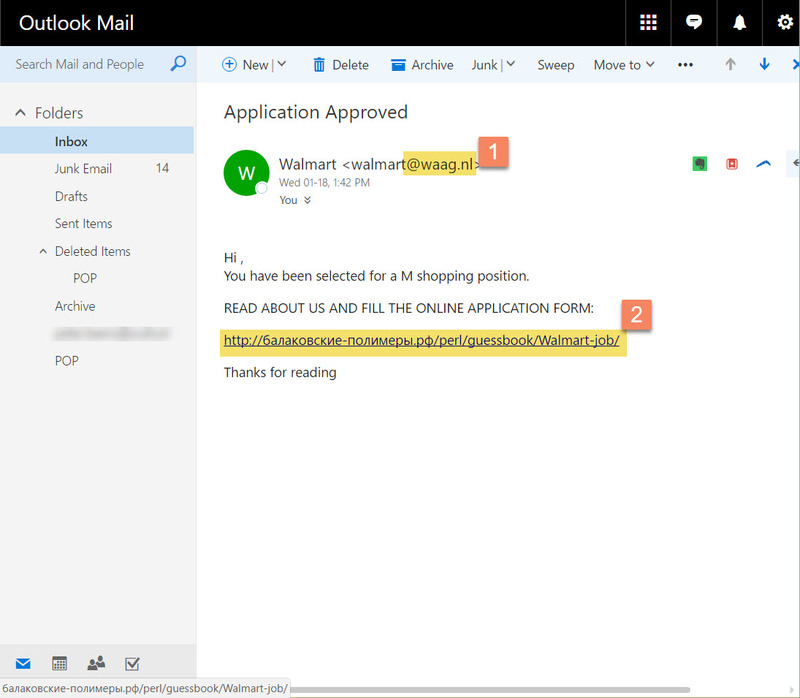 I didn’t even realize that Hotmail was still around. I’m amazed at how many teenagers have Hotmail accounts. Ah, you’ve reminded me that I should check my spam folder occasionally. I checked it now (in Gmail) and of ~500 spam messages one was legitimate. Thanks for the tip!